A. It's basketball for children of 12 years and younger. Q. How does it differ from Basketball? A. It simplifies the game of basketball for children. The goals are lowered, the ball is smaller and we use a smaller court. We even reduce the number of players on the court to play say 3 v 3 or 4 v 4 leading up to 5 v 5. Have you seen children follow the ball like 'bees around a honey pot'? We play with fewer players in each team to give more time & space and stop the crowding. In our Mini-Basketball activities we may use uneven teams 2 v 1 or 3 v1, 3 v 2 to stretch the more able or to give more opportunity to pass the ball as a team. The height of the goal is lowered according to the age and height of the children (see rules). The ball used is either a size 3 for the youngest children or a size 5 for older. Children are encouraged not to practice with a size 7 adult ball until they are teenagers. Q. Could I become qualified in Mini-Basketball? A. Yes, Mini-Basketball England has its own Mini-Basketball Coach Award. We also recommend that Teachers, SSCos & Community Basketball Coaches attend national training to become Licensed Mini-Basketball Trainers. This is a programme organised through Val Sabin Publications & Training. It is a one day training course and participants receive a copy of Mini-Basketball, A Guide to Teaching & Coaching as well as a Licensed Trainer's manual. The course is very well regarded nationally and is ideal for those of you who would like to tutor teacher & leader courses. Q. How can you help my teaching? A. If you need help with your teaching of mini-basketball then the best bet is to purchase the internationally acclaimed teaching manual: Mini-Basketball, A Guide to Teaching & Coaching for your school. It can be purchased from Val Sabin Publications & Training. This manual is similar in format to Val's Gymnastics, Dance and Activate manuals that you may already use for your curriculum PE. MBE also delivers courses to provide you with practical examples of how to teach mini-basketball and organise after school clubs & festivals. It would be good if we could organise a course especially for you. If you are interested contact Martin and we can see if a course could be organised in your School Sports Partnership. Q. How do you recommend we approach it? A. Initially, introduce it in PE lessons, as part of the National Curriculum, to children from reception to Year 6. There are many skill based activities and small games that can be featured.So are you saying all teachers who deliver PE, even those of us that have little affinity to PE, would be able to use these activities? If so, how do we go about it? Invite Mini-Basketball England to lead a Teacher Awareness Workshop for all your staff. By the way, you can ask your ancillary staff and parents to join you. These workshops are often followed up with Teacher-in-Class-Development sessions, when the MBE tutors revisit school and work throughout the day with each teacher and his or her class. The children love it, but its principal aim is to reinforce the teacher training. Q. Where do we play Mini-Basketball & what equipment would I need? 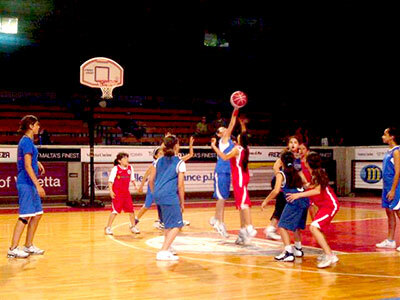 A. Mini-Basketball can be played indoors in the school hall as long as the area is free of obstructions and ball games are allowed in the space. Alternatively play outside on the playground in the same space as you would play netball. 30 size 3 Mini-Basketballs for key stage 1 children. 30 size 5 Mini-Basketballs for key stage 2 children. It would be great if you could purchase Mini-Basketball goals. The official height varies according to the age-group but the maximum height of the goal should be 2.60m. The Little Tike Goal is ideal for key stage 1 children. You can use skittles or a goal catcher behind a line instead of a Mini-Basketball goal. You will also need cones & markers for group activities. Q. I'm already a Mini-Basketball enthusiast but there are not many local schools that play. What do we do? 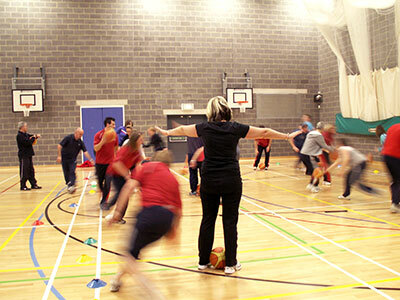 Stage One: Organise a Mini-Basketball Development Day in your SSP inviting SSCos, teachers & coaches from local clubs. 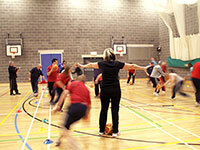 Stage Two: Organise a 'Come & Try' Mini-Basketball Festival for local schools. Stage Three: Integrate Mini-Basketball Festivals & Training into the SSP calendar of events. Q. When do you suggest would be the best time to mount a workshop? A. It could be at the end of the school day or on an INSET Day. It's two full hours of activity, but not too energetic and demanding. No one is embarrassed, in fact, they are surprised the activities they can do. It is best to plan well enough ahead so it is part of the school INSET programme and you avoid clashes, thereby ensuring a full teaching staff participation. Q. Who leads these workshops? Are they experienced teachers? A. The principal leader is Martin Spencer; Martin is respected as the world's authority on Mini-Basketball and leads training for teacher trainers across the world. Martin is a very well qualified teacher and coach of Mini-Basketball and Basketball. Q. Are there any resources that will support this training? A. An excellent reference manual is 'Mini-Basketball – A Guide to Teaching and Coaching' by Martin Spencer. It's quite the best. It includes: Philosophy and rules, over 250 games and practices, programmes of study for National Curriculum, units of work comprising detailed lesson plans which are progressive and developmental, assessment procedures, a player award scheme and circuits and challenge cards - a must for the staff library. 'Mini-Basketball is….' – promotional leaflet. 'Mums and Dads We Welcome Your Support' – guidance to parents how best to support their children. 'Mini-Basketball Guidelines' – a management guide. 'Organising a Fun 'n' Games'. Q. We haven't any equipment, what do you recommend we purchase? A. Balls: For children in reception to Year 4, you need one size 3 Mini-Basketball for each child and one or more portable 'Little Tike Easy Store Goals'. For children in years 5 to 7 you need one size 5 Mini-Basketball for each child. Goals: There are many options for goals and you need to seek advice from Mini-Basketball England. Ideally you would have goals for inside, where most of the PE lessons will take place, and outdoors. Indoors, height adjustable goals fixed to the wall are best, BUT maximum height should be 2.60m, so they can be lowered for younger children. There are a number of portable goals but take care because some designs on the market are unsafe. Outdoors the best buy is a steel vandal proof goal at Mini height. Ball baskets or nets for storage and easy movement. BUY QUALITY. It is worth buying good quality. Cheap balls often deflate quickly; nothing is worse than going to the store for the balls only to find again you have to pump them. MBE recommends the Molten Mini Ball (G5). Likewise cheap goals on the market are often safety hazards, study the design carefully and seek advice from experienced Mini-Basketball teachers and coaches. Coloured Bibs. They are more practical in lessons that t-shirts. There are several sources of funding talk to MBE. The excellent magazine 'Sportsteacher' has recently published a 'Guide to PE Funding'. Q. How is it best to introduce children to competition? A. The programme commended by MBE gradually exposes boys and girls to competitive experiences and in time in years 3 and 4 the children are ready for 3 v 3 invasion games. In fact, all the children in the primary phase benefit from playing the 3 v 3 game. Each of them gets more opportunity to develop their skills and to employ them in the game situation. Researchers confirm that many children in the primary stages can only really cope well with two options, therefore the 5 v 5 game is too demanding. MBE is piloting a new initiative 'Take Six', which will become the best tool to develop the team competition. We have regular competitions school to school in soccer, rugby, netball, swimming and track and field. How do we work towards those in Mini-Basketball? It is important not to rush. We have found that in some parts of England no sooner than Mini-basketball has been introduced to a school, someone proposes that there be a competitive rally. The scores on the day are very disappointing 4 – 6, 10 – 12 or even worse 0 – 20. It does nothing to inspire the children; in fact you could turn them off. Create competitive experiences in school, within the regular school club, maybe class to class. Teachers and their assistants can develop their own coaching technique then without feeling under pressure to protect the esteem of the school. In due course, mount a Fun 'n' Games session. Several schools bring together an agreed number of boys and girls; say 5 boys and 5 girls from each of four schools. After a welcome and warm up there could be a short programme of skill development activities. Maybe that would be followed by a brief session on children officiating. They love that and make good officials. MBE has a well thought out training programme to prepare child officials. The latter part of the session is for a series of games when the children are divided into four teams each with five boys and five girls with representatives from each school. Teachers can then sharpen their coaching skills by working with the teams again with no fear of undermining the esteem of their respective schools. The children love it. From such beginnings more formal competition grows as has been witnessed in Nottinghamshire, Northampton and North Hertfordshire. Q. So doesn't it follow that the children seek out Mini-Basketball clubs at school and in the community? A. Yes and since most of the mini-basketball equipment is in schools or on their playgrounds, we feel it is best initially to concentrate on school clubs, using the services of teachers, ancillary members of staff and parents. A 'Managing and Coaching Mini-Basketball Workshops' can be organised to prepare them – management issues, advanced skills practices, planning programmes and coaching games. In Nottinghamshire from such beginnings there are now a number of discreet clubs providing regular training and competitions for children. MBE's long-term goal is to repeat this across the country. Q. Does Mini-Basketball England have a strategy for working with the emerging School Sports Partnerships? A. This is an exciting new initiative that is speeding up the development of Mini-Basketball across the country. MBE is in dialogue with Partnership Development Managers and School Sports Coordinators designing and delivering programmes of Teacher Awareness Workshops. Together we are offering training to primary and middle schools and advice on seeking funding to purchase equipment. On the back of these initiatives, MBE is being invited to lead training modules to add onto the secondary school & college young sports leader award courses being mounted for year 11, 12 and 13 students and where those students prove capable they are assigned to visit school regularly to assist teachers and parents run Mini-Basketball clubs. Q. This sounds ambitious, where does Mini-Basketball get its funding? A. MBE is supported by England Basketball, contributions from course organisers and sponsorship.